So, can I use RF60 with V6 on my sony A6000. And if the answer is yes, is it possible to use the RF60 in HSS off-camera without a TTL/HSS flash on-camera? I found that the Phottix Mitros+ can do HSS off-camera with the Phottix Odin on camera or with another Mitros+ on camera... but the price is just to much for me. Yes, you can use a V6 on your A6000, since the latter has an ISO compatible hot-shoe and the V6 only needs the centre pin contact (not the non-standard extra Sony contacts). Regarding off-camera HSS you should be able to use it with RF60s up to a certain shutter speed. On my Pentax I can go up to 1/2000s before I see a black bar creeping in. Beyond this shutter speed, you will need so-called pre-sync timing for the flashes. The camera will only provide it, however, if it assumes an HSS-capable flash is being used. If you can somehow achieve the latter than you can use the V6 to trigger on the pre-flash and use a delay to make it coincide with the main flash, but a V6 on its own will not make a camera assume an HSS-capable flash is involved. For the price, it seems to me that Cactus is a very interesting choice... I think I will give it a try! There is no profile for the Sony A6000 in the Cactus V-6. I've read they are not compatible. I would hold off until it is confirmed by Cactus and/or Sony that they are compatible. @fotoman: The Cactus V6 does not have profiles for cameras (only for flash models) and does not need to have camera profiles. The Sony A6000 works with a lot of third-party gear and I see no reason why the V6 wouldn't work as well. Sometimes, however, it seems to be necessary to tweak the A6000's hot-shoe a bit in order to make it work with third-party gear. Are you an employee of the company? I really don't want to risk it until I have verification from them. Are you an employee of the company? You have asked me that before and the answer is still "no". I just happen to know that the A6000 has the newer Sony hot-shoe type (the former Sony hot-shoe type was of the Minolta design) and hence should work with all third-party single-pin triggering devices. I'd be very surprised if the V6 wouldn't play with an A6000, potentially after a bit of tweaking of the A6000 hot-shoe, as necessary for other products as well. I really don't want to risk it until I have verification from them. Are you contemplating to buy an A6000 and are seeking confirmation that it will play with the V6 triggers you already have? Initially I thought you were just trying to advise the original poster, but now it seems you have a personal interest in getting an authoritative answer, is that right? I bought four Cactus V6s, one to use as TX on top of a Sony A7ii, three to use on Nikon SB-910s as RX. The V6s talk to each other, and fire the flash with the TEST button, but the flash will not fire when I press the A7ii shutter button. I have tried the A7ii in both WIRELESS and FILL FLASH modes. Is the problem the weird A7ii "multi" hot shoe, or something else? HI @fotoman there aren't any profiles for cameras, but only for portable flash. My colleague @raychan has been using the A6000 with the V6 and no problems so far. ... but the flash will not fire when I press the A7ii shutter button. I have tried the A7ii in both WIRELESS and FILL FLASH modes. Is the problem the weird A7ii "multi" hot shoe, or something else? Hi @Beban, when you press the shutter button does the V6 TX LED flashes green? Fill-Flash is the correct option. Don't select wireless mode. Sony does have the Multi Interface Shoe (MIS / MI shoe) despite it looks like a standard ISO shoe it's not. That said, the centre hot shoe pin is still in the centre more or less and it's in contact with the V6's so basic flash triggering is not a problem. Thanks for replying. Using fill-flash setting on the A7ii. No, the green light does not go on when the V6 is mounted in the A7ii hot shoe in TX mode and I press the shutter button. The A7II should work with the V6 so it should be a hot shoe connection issue. I have tested consistently firing the gren LED (and the flash) on our own A7R. Make sure your V6 has been inserted fully into camera's hot shoe mount. Also, test with your camera in M mode. Yup. Done ALL of that, wiggled the Cactus in and out of the hotshot incrementally, shooting with each wiggle, and still no luck. And I shoot with the camera in the M mode always. Don't like the automatic modes. So, do I take the camera to the Sony dealer and ask there? (Incidentally, the Cactus V6s work wonderfully with the Nikon D7000 and SB-910s. I bought the V6s when my SU-800 controller went bad, specifically to use with them, and also (I hope) with the Sony. @Antonio: In the thread that Richard created specifically for his question, he replied to one of my suggestions that the SB-910 is not firing in the Sony hot-shoe either. Given that the same SB-910 can be fired with a V6 Rx, does that not indicate a problem with the camera's hardware or at least its configuration? It is conceivable that it is just a centre pin connection problem, but given his report of attempts to move the flash in and out on a millimetre basis, trying to establish contact with the centre pin contact, that seems unlikely. Is there another possibility of a different hot-shoe connection problem, similar to the need to remove some paint on the A6000's hot-shoe to establish contact? @Beban: The best course of action seems to somehow confirm that your camera is doing its part. One would hope that a dealer would at least be supportive of getting the SB-910 to work, if not the V6. The V6s talk to each other, and fire the flash with the TEST button, but the flash will not fire when I press the A7ii shutter button. If the V6 can talk to each other with the Test Button, meaning the LED would light up the V6 LED status lamps in orange at half-press and green on full-press, subsequently firing the SB-910, then it shouldn't be a problem with the Nikon speedlight? What I did with mounting the V6 on our A7R is I simply inserted it fully into the camera's hot shoe, till the very end. The V6 would look as if it's still sitting on the ledge but it's indeed fully inserted. A6000 wihtout doing any mods. mounted unit status lamp blinks green at full-press. 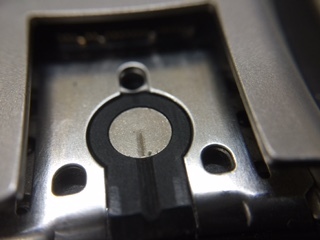 FYI: Those who only has one V6 unit can do the above test by connecting the centre pin to the metal plate using a conducting device such as a metal keys, scissors, knife, etc. If the V6 is functioning normally the status LED will light up green. Thanks and I look forward to your test results. That's correct. So before I use something that might void my Sony warranty I prefer to have a company agent confirm the compatibility. So before I use something that might void my Sony warranty I prefer to have a company agent confirm the compatibility. Antonio (Senior Marketing Specialist) confirmed twice in this thread that his colleague "raychan" uses a V6 successfully on an unmodified A6000. That sounds like official confirmation to me. I agree that there isn't a problem with the SB-910. When I suspected a "hot-shoe connection" problem, I did not refer to the V6 hot-shoe. Rather, I referred to the A7ii's hot-shoe. If the A7ii's hot-shoe were functioning then it should be able to fire an SB-910 mounted directly on the camera. Since, according to Richard (Beban), the SB-910 does not work on the A7ii, but does work on the V6, I'm suspecting that there is either a problem with the A7ii's hot-shoe or that there is still an A7ii configuration problem. Community (Antonio, Class A, fotoman)! Long story short: bad hot shoe on the A7ii. Long story: I took the A7ii, an SB-910, and two Cacti (for TX and RX) to the camera store here in Paris where I bought the Sony. Amazingly (French clerks are not noted for their enthusiasm or customer service), TWO clerks jumped on the problem. They put the equipment through its paces on an A7R, and another A7ii, and it worked both times. So much for the You Tube idea that the matte finish hot shoe needs to be sanded. They also tested the Cacti on a Nikon camera, and naturally, it worked fine. They tried my A7ii with a Pocket Wizard adapter and a synch cord. Still didn’t work. So, my A7ii is now off to the European Sony repair center (under full warranty) and I won’t see it for at least two weeks. But I’m glad that the problem has been identified, and I can shoot with my D7000, SB-910s and Cacti until the A7ii gets back. Again, thank you. Fine support here. Good to hear that the riddle has been solved. FWIW, the YouTube video was for the A6000. Everything pointed to the A7II having an issue and I was just at a loss what it could be since a configuration error seemed unlikely. Hence, not knowing the A7II in detail, I wildly speculated that the A7II's hot-shoe may sometimes need a similar treatment to the A6000's hot-shoe. Anyhow, good to hear that you weren't given the "we don't support third-party equipment"-treatment and that you'll get the problem sorted under warranty. I tried the V-6 with the RF60 today on my Sony A6000 and could not get them to work. I wiggled and waggled the flash and trigger on the Sony hot shoe and even got them to fire a few times but I just couldn't see doing this long term. It seems the hot shoe contact had to be adjusted after each shot. I'm going to have to try something else, unfortunately. @Beban, I am happy to hear the dealer has identified the problem. Hopefully Sony can get it repaired to you sooner! Keep us posted after getting your A7ii back. @fotoman, that's really weird... I wonder if Sony hot shoes have some tolerance issues? Have you tried the trick Class A post in above's video - by removing paint of the hot shoe? I'm not altering my camera equipment to accomodate the hot shoe. I'll find a fix that won't void my warranty. Sony sent back the a7ii saying there is nothing wrong with the hot shoe. Cactus V6s still don't work with it. As previously posted, everything is fine using the Nikon D7000 with Nikon SB-910s, so the Cacti are fine. Any other suggestions? I am truly frustrated. I'd ask your dealer what to make of the statement by Sony that "There is nothing wrong with the hot-shoe" when the dealer has clearly confirmed that another A7II and an A7R work with the Nikon flash and the V6, while your A7II does not. Hopefully you can make the dealer resolve this with Sony. It would not be the first time when a product comes back from a repair with the note that "nothing is wrong with it" while the respective technician just has to failed to understand what the error description is about. Maybe your A7II has been tested only with Sony-specific flashes and the technician has thus failed to check whether the hot-shoe also works with third-party products (which it clearly should). More fuel for the fire: The Cactus system works fine with my Ricoh GR. I hadn't thought to try it until a friend suggested it. Not that the Ricoh (my go-to camera for street candids) would be a choice for flash, but just to know that it works. Back to my dealer (tomorrow, things are closed Sunday-Monday in Paris). OK, I never would have believed this, but the Internet hack worked. I apologize for my reticence in the face of those who suggested it. But, at my wit's end, having Sony claim there was nothing wrong with the hot shoe, and my dealer unable to do anything else, I bought some fine sandpaper and sanded the hot shoe, then wiped the remaining paint off with acetone. I let that dry for a couple of hours. Voila! The Cactus triggers all worked. The A7ii now controls my Nikon SB-910s, which is why I bought the Cactus in the first place. Good product, good community here. Stupid idea, Sony, painting the hot shoe. ... Voila! The Cactus triggers all worked. The A7ii now controls my Nikon SB-910s, which is why I bought the Cactus in the first place. Good product, good community here. Fantastic! So the old-school way of sanding off the paint works! I am really not sure why many A7 users don't need to sand any paint off. Maybe they mount a flash device on it so often that the paint has already been scrapped off? Anyway I am glad it's working now!